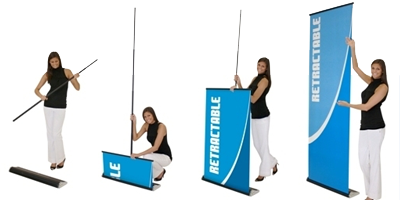 Roll Up Banner Stands or Retractable Banner Stands are an attractive and convenient way to showcase products and messages to a target audience. They are portable and flexible structures that are easy to use. They work like a window blind- simply slide up the graphic over a pole and secure it. When finished, remove the pole, retract banner and put it back in its case. It is that simple! Banners are printed at 2400 dpi on a super smooth vinyl. They can be either single or double sided. 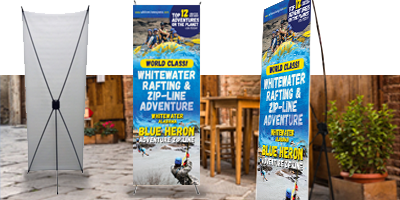 Lightweight composite banner stand is easy to assemble and holds a 2' x 5' 9" or 2' x 6' vinyl banner finished with grommets at all four corners. Comes with handy nylon carrying case. Backlit signs offer inviting, highly saturated color and help your message stand out in darker settings. 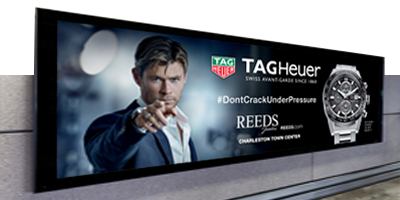 Whether they appear on vending machines, nightclub signs, or airport displays, backlit graphics have become an important part of today's signage and promotional-display industry. 15 oz. back-lit substrate that can be used for a wide variety of illuminated indoor or short-term outdoor sign applications. Its smooth print surface is specially engineered to avoid flow marks when back-lit.